Day 1: Arrive at Marrakech, reception by our hotel staff. Day 2: Depart by Minibus towards Demnate 110km 3H of VTT, about 4 km with rises positive and negative 200m. Day 3: Imin Ouaqqua (1900m) - Tizin Tirghist (2390m) - Abachkou - (1750m) - Iskattafen - Night with local people at 1800m, 43km positive 500m and negative 600m rises. Day 4: Iskattafen - Ait Bouguemmaz - Col Tirghist (2640m)- Assemsouq - Nuiti Zaouiat Ahansal - 56km. Denivele positive 1300m and negative 1100m. 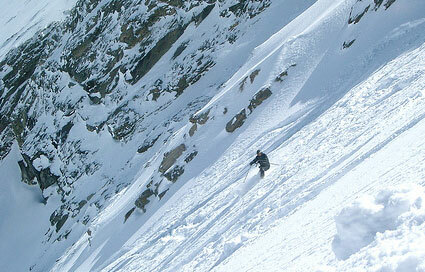 Day 5: Amezrai (1600m) - Rockets - Anergui (1800m) - 75kms / denivele positive 550m and negative 500m. Day 6: Anergui - Col Roud N' Iroul (2480m) - Night at Tasrafte - 50km / denivele positif 1000m and negatif 600m. Day 7: Return to Marrakech - 30km of VTT / 400km by car. Day 1: Arrival at Marrakech and transfer to the hotel or riad. Day 2: Transfer to Tabannt, then Imi-N-Ifri, assembled VTT, lunch at Oukrim, 1000m, camp in Imi-N-Ouaqq. Day 3: We rise the col of Tizi-N-Tighist at 2400m, in where there are rupestral engravings. Descent towards the valley Ait Boulli, lunch at Guersif (under walnut trees), in the afternoon crossing the happy valley (Ait Bougummez) 1800m, night at the inhabitant or camp. Day 4: Ait Bougumez valley, Tabannt (alt 1850m) assembled col Tighist 2629m Asurki 3700m, lunch at the small village of Assamsouk 2300m. Afternoon rise of the col of Tizi-N-Llissi 2606m, remarkable view on the beautiful walls of Aroudan then overnight at the village Zaouiat Ahansal 1600m at the inhabitant. Day 5: Zaouiat Ahansal - Anargui descent of the Ahansal valley until the foot of Marfaman and its 800m of walls which known also by the "cathedral of rock". Lunch at the edge of the river, 1100m at the foot of Marfaman, increase of the deep throats of Assif Melloul. Camp at Anargui. Day 6: Rise of the col Afoud-N-Iroul 248m descent on the village of Tasref 2000m, where we picnic. Later we head to the village of Assif Tarzoute, increase of the Akka-N-Ouanine valley, discovered of a blue lake exemption, the pearl of the Atlas, the lake Tslit. Day 7: Travel along the small river of Assif Melloul, Village of Moussem of Marriage Engagement is the greatest festival of the Atlas. Now to Todra, then rise to the col Tinrhouzine 2700m, and a long descent on the multicolored field valley, Ait Hani. Day 8: Ait Hani to the Todra gorges. A little attended stage which goes up a valley in a mineral desert, to cross the Tamtatoucht village, then the Todra throats. Day 9: Crossing towards Merzouga by cars, in the sand of Erg Chahbi. Day 10: Merzouga back to Marrakech to visit the Kasbah of Teloaute. 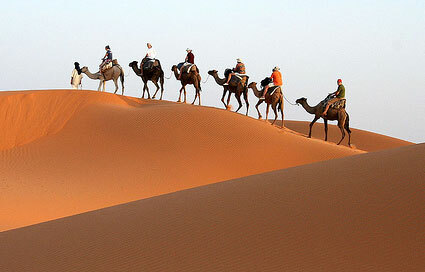 Overnight at the hotel or riad at Marrakech. Day 11: Free day to discover the red city. Day 1: Arrival in Marrakech. Check the bikes and briefing. Tour around the city of Marrakech. Diner and overnight accommodation in a hotel. Day 2: Departure from Marrakech by Land Rover crossing the Tizi N'Tichka pass 2290m, down the mountain on bikes to Ait Ben Haddou where we camp by the river. Day 3: Departure southwards to the desert in the Land Rover. 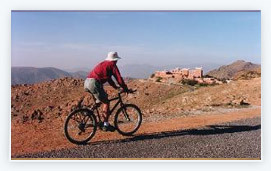 Cycle the valley of 1000 Kasbahs and the Draa Valley, then to Bivouac. Day 4: We leave the palm grove via Tizi N'Tafilalet and cross a rocky plateau by bike, volcanic landscape. We camp near the Village of Iminouassif 1000m. 40km. 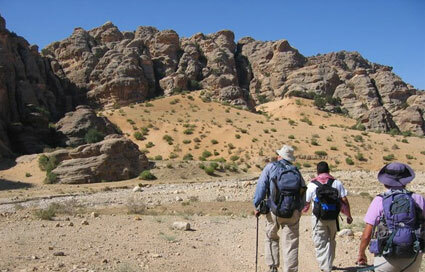 Day 5: Leaving Iminouassif, we cross the Oumjrane plateau, passing through the sand dunes and the Taghbalte Oasis. We then travel up to Tazarine where we spend the night under canvas. Day 6: Across the Saghro Massif to camp at Bab Ben Ali, surrounded by rocky outcrops. Day 7: We continue climbing, up to 2500m, and crossing the Tizi N'Tazararte pass, followed by a spectacular down hill arriving at Ait Youl. Day 8: Leaving Ait Youl we go up the Dades Valley through Berber villages, stopping near the Msemrir spring. Then on to Tamtatouchte through the Tizi N'Ouanou pass 2700m. The night is spent under canvas at Tizi N'Ouanou. Day 9: Across the Ait Hani valley, more Berber villages and the Agdal Imilchan valley. Overnight camping at Imlchil. Day 10: Departure from Imilchil, crossing the plateau and down hill for 12 km to the Aguedou valley, spending the night under canvas at Ait Brahim. Day 11: Around Mount Mesker to camp at Tounfite. Day 12: Leave Tounfite by Land Rover and then through to Beni Mellel and Marrakech. Dinner and a night in a hotel. Day 13: Transfer to the airport.